The Leicester business community come together to celebrate Soft Touch Arts’ 30th Birthday, with their biggest exhibition yet. Leading firm of chartered accountants, Newby Castleman, is sponsoring a VIP event marking the start of a Leicester based children’s charity’s 30th birthday celebrations this November. 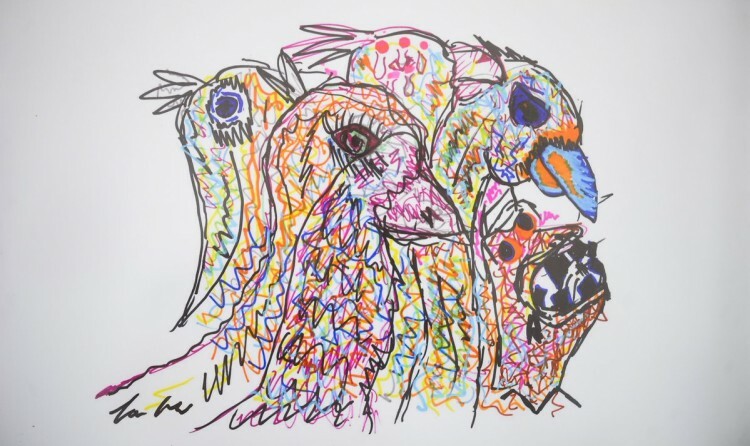 Artwork by prisoners at Glen Parva Young Offenders Institute has gone on display in a city art gallery and features a diverse mix of paintings, sculptures, models and sketches. We're pleased to announce that funding has been secured to launch a new project to support some of Leicester and Leicestershire's most at risk young people. 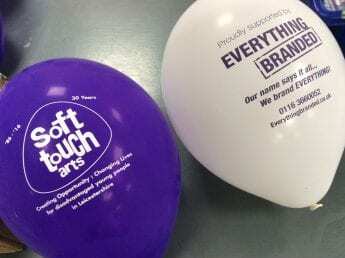 EverythingBranded.co.uk were proud to support Soft Touch Arts at a fundraising barbeque on Friday, July 1. A new charity headquarters and a city business park have picked up awards for architecture. 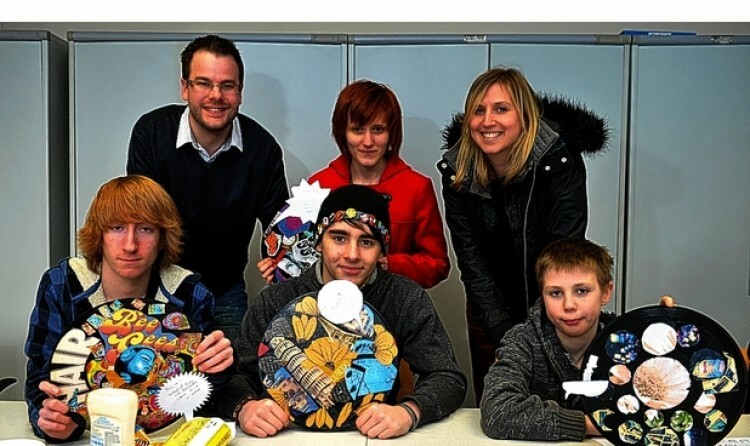 A Leicestershire charity has been helping young people get creative with a little help from Overbury. A charity has received a generous donation of more than £9,000. A Leicester youth arts charity gave HRH The Earl of Wessex a right Royal welcome today as he officially opened open the doors to its new £1.1 million premises. "A boss at a children’s arts organisation in Leicester on working in the charity sector"
Christina gives an insight into a typical day at Soft Touch Arts. Art is being used to boost the mental health of young men at Glen Parva Young Offenders Institute. Hundreds of youngsters welcomed the Earl of Wessex on a visit to Leicester and the county yesterday. 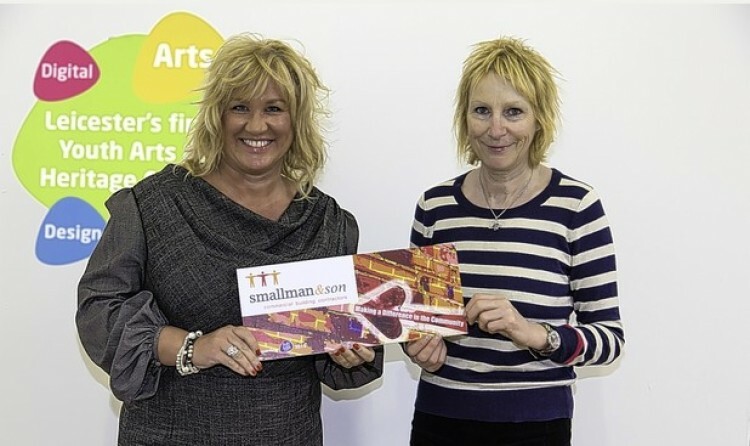 Soft Touch Arts has launched a Brick in the Wall campaign to raise £5,000 towards a £30,000 target to complete its new £1.1 million Youth Arts and Heritage Centre. "As creative organisations, both Arch and Soft Touch agreed we could form a great partnership." A PIONEERING arts organisation has ambitions plans for the future after being handed the keys to its new city centre home. Tucked between two terraced houses, behind a big blue door, one hard-working community project is making a huge difference to the lives of local people. Leicester City Council is planning to sell a former nursery on New Walk. I remember how boring youth clubs were when I was growing up: going to an old, shabby hall with maybe a pool table and some naff music playing on the stereo. An ex-teenage offender who won a community award after turning his life around has helped to launch this year's search for young achievers. Walking into that particular exhibition I was met by a huge bird sculpture, suspended from the ceiling, wings outstretched and in full flight. The imagery has stuck with me as a statement, and visual metaphor to what Soft Touch Arts is about – inspiring confidence and aspiration, and making young people realise their true potential. At any one time, Soft Touch Arts facilitates up to 20 projects of this kind; creative outreach programs offering support to young people who may have fallen through the gaps in the society, perhaps via the exclusive UK education system or in family infrastructure. Vulnerable to trouble, these young people are welcomed as part of the ‘Soft Touch family’ through various creative outreach programmes – from music to arts, crafts or cultural education – all offering a more positive engagement and identity than they may have encountered so far. With projects varying so much, they now employ 14 staff and have an expanding pool of volunteers to call on. Most recently, the organisation joined the Voluntary Action Leicestershire (VAL) group on a £1.94m project to support some of Leicester and Leicestershire’s most at risk young people, specifically supporting them to gain employment, and, whilst long-term projects such as this take place, Soft Touch continues to experiment with new ways of connecting with vulnerable young people in the immediate communities. For example, every Friday and Saturday night the Soft Touch Arts Studio Van is taken to local estates to run creative sessions on the streets. Speaking with Business Strategic Director, Christina Wigmore, she states “The police love us as anti-social behaviour stops when we’re around!” Using solar power, the van is kitted out with a high quality music studio, and a ‘creative kit’ that enables t-shirt printing, digital photography and other craft activities to take place. But no matter how big or small, the common ground every Soft Touch Arts project shares is the participant-centric attitude. The Soft Touch team ask ‘What do you want to do?’ rather than ‘Here is some arts materials, and this is what you should be doing.’ By putting their opinions and creative ideas at the forefront, these young people receive a respect, dedication and attention that may have been absent from their lives in other senses. Set up in 1986 co-founders Sally Norman and Vince Attwood quickly established Soft Touch Arts as a modest Co-operative, automatically aligning the organisation with an entrepreneurial aspect. It was against everyone’s advice that Soft Touch Arts came to fruition. Thatcher’s 1980’s Britain didn’t have a great belief in the arts, and especially in the arts as an outreach programme. Thatcher famously said that community arts are actually socialist arts – which suited Soft Touch Arts just fine, and confirmed their belief in what they were doing. This absolute determination runs true in every aspect of Soft Touch Arts work. Certainly, this is the crux to their 30 years success, and essential if you’re to make a business of arts outreach programmes to excluded and hard to reach communities. To celebrate the milestone Soft Touch Arts will be returning to the iconic 80’s for inspiration, hosting an array of themed projects and events for the community. An exhibition featuring the work of current project groups will be displayed at the 86:16 Exhibition that has been produced with sponsorship from local businesses. RG+P Architects have contributed the time of two young architects, to produce a feature Rubik’s cube sculpture in co-ordination with a Soft Touch program. Local designer Betty Brown has been designing iconic 80’s fashion garments with another group – hopefully shoulder pads galore! Other companies have offered sponsorship in kind; press liaison from Mocha Marketing; a new website and animated logos from Arch Creative. All of the above demonstrating Soft Touch’s creative attitude to funding and business too – key as it continues to establish itself within the Leicester business network. Though it may be ‘good for the soul,’ how does Soft Touch Arts quantify its success? On one level, the organisation has to answer to the systemic evaluation of funding from public bodies, trusts or foundations, measuring the change and progression for those that take part on an analytical level. On another level, it is a ‘vote of feet.’ If it’s not interesting, quality and relevant, young people will not engage – “quite simple” as Christina puts it. Then, there are the personal stories. No matter how much analysis you can attempt to constrict Soft Touch Art’s work within, to satisfy red tape officials, certain stories concisely define the success of Soft Touch Arts to a T. “There’s one young man we work with and they key difference for him is not so much that we’ve stopped his offending – it’s that he gets up in the morning excited about what he’s going to do that day. That’s the power of what we do and everyone needs that in their lives.” The stories are not in isolation, and it’s the volume of them that make me intrigued and excited to see the development of the Soft Touch Arts legacy in the future. 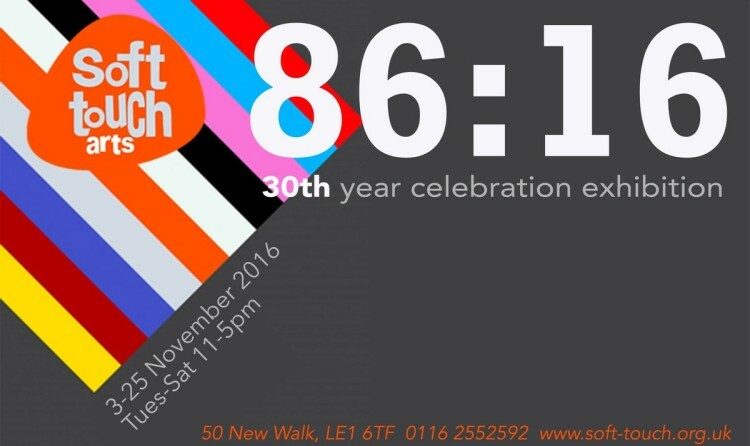 Join in the celebrations at upcoming Soft Touch Arts events on Friday 25 November for 86:16 – a multimedia design exhibition featuring the work from young people, and all those “blasts from the past” and Saturday 26 November for I Love the 80’s. 2016 marks the 30th anniversary of Leicester based charity, Soft Touch Arts. Based on New Walk, Soft Touch Arts have been helping disadvantaged young people in Leicester since it was founded in 1986. To celebrate this landmark year and showcase the talents of young people, they will be hosting a special multi-media 80s inspired design exhibition with associated public and VIP events, all made possible with brilliant support from the local business community. Rg+p Architects, Overbury PLC, Arch Creative, Morgan Gleave Art and Design, Newby Castleman, Betty Brown, Ventola Projects and Mocha Marketing have all pulled together to offer their services and funding to support the exhibition. The exhibition will run from the 3rd – 26th of November, with a range of creative workshops on Saturdays for the public to take part in for free. 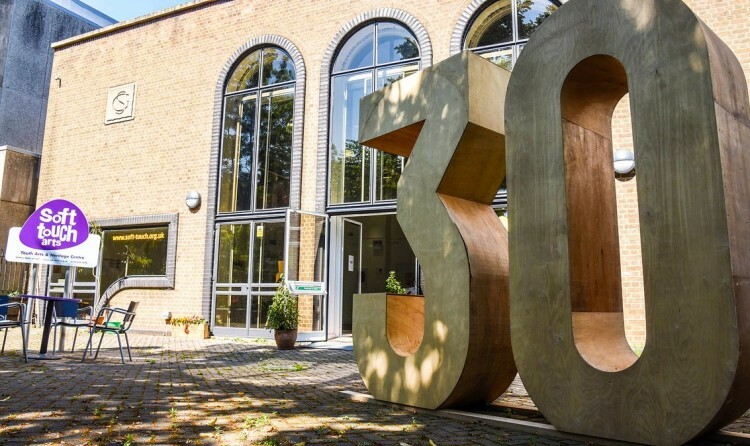 To launch their 30th year celebrations, a VIP Private View and celebration event will be held in their building at 50 New Walk on the evening of Wednesday 2nd November. Leicester based Mocha Marketing, have announced their recent partnership with Leicestershire charity, Soft Touch Arts. Situated on New Walk, the charity help disadvantaged young people and support them with challenges in their lives, by engaging them in projects which build creative, social and employability skills. Each and every year they work with around 1000 young people. Mocha Marketing have developed a close relationship with Soft Touch Arts since the beginning of 2015 and over the past year, have supported the charity in many different ways. 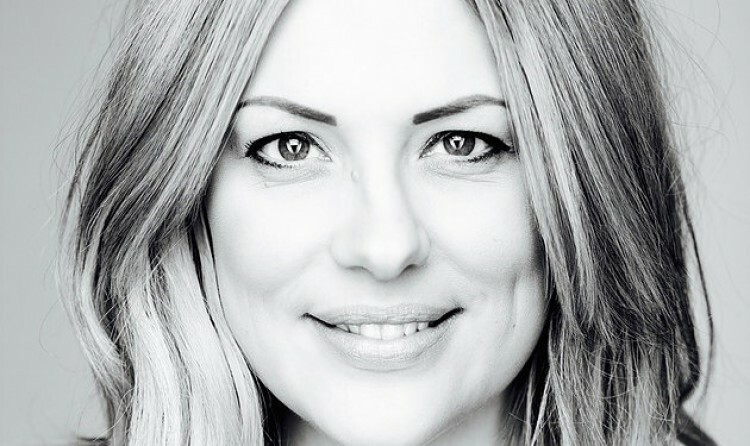 Founder and Managing Director at Mocha Marketing, Gemma Orton, has had the privilege of working with Soft Touch Arts as a Business Mentor to one of their young people, for the past 12 months. It was seeing the impact that the charity has on so many deprived young people in Leicestershire, that Gemma wanted to support on a greater level. Charity work has always been important to Gemma, which is why she instills this in to the working ethos of the business also. As the relationship developed with Soft Touch, so did the working relationship between Mocha Marketing and Soft Touch Arts which has led them to become the charity’s Official PR Agency. In addition to this, Mocha Marketing have pledged to raise £1,500 by the end of 2017 for Soft Touch Arts as well as supporting the business ambassador panel and managing much of the PR requirements for the charity. Christina Wigmore is the Business Development Director at Soft Touch Arts and is excited for what the partnership can bring. “Soft Touch is absolutely delighted to be offered this partnership opportunity from an agency that really care about making a difference in local communities. It’s hard for small charities to make the most of PR opportunities due to limited staff and financial resources and Mocha’s experience will help to raise the profile of our work and the impact we have on disadvantaged young people across Leicestershire”. The charity has also just won the ‘Social Impact’ award at the Leicestershire East Midlands Chamber Awards. This is an achievement that both Soft Touch Arts and Mocha Marketing are thrilled with. Gemma is hopeful that this newly established relationship can continue for many years. Passionate about giving young people a chance, the Big Lottery funded BIG-UP New Parks programme ran from 2011 to 2016, focusing on some of the issues and needs identified by young people, adults and organisations on the estate. The aim of the BIG-UP programme was to deliver creative sessions in schools, community centres, youth clubs and on the streets of New Parks and Braunstone Frith. The project enabled the charity to work with different groups of people, using the arts to achieve a range of positive social outcomes and create progression routes for individual participants. A young man who is a New Parks resident believes that the BIG-UP project really helped him to develop. The second project which is featured in the exhibition is a 3 year collaboration project with New Parks Library, funded by Arts Council England. This programme has been running alongside BIG-UP and enabled Soft Touch Arts to work together with well-known local artists such as Paul Conneally, producing a variety of work that has been strongly conceptual. Sally Norman, Director and Founder of Soft Touch Arts is excited for the future projects that the charity are working on. The New Parks Art exhibition celebrates the end of the BIG-UP New Parks programme and features work from both projects, as they complement each other perfectly – BIG-UP using arts as a tool to address local issues, and the Arts Council funded library project producing great art and working alongside established artists. The exhibition is free to attend and is running from Tuesday 9th August until Tuesday 23rd August from 11am – 4pm at Soft Touch Arts on 50 New Walk Leicester, LE1 6TF. An arts project that helps city youngsters make the most of their potential has been expanded thanks to a £391,000 lottery grant. Soft Touch Arts, in New Walk, has been running its Big-Up project in New Parks for the past five years. The funding came to an end this summer but now a Big Lottery Fund cheque for £391,000 will allow Soft Touch to carry on their work and expand the project to other parts of North-West Leicestershire, including Beaumont Leys, Stocking Farm and Mowmacre Hill. Cultural activities such as cooking, crafts and music will be organised along schools and community groups and they will lead to mentoring and working with young people to help them fulfil their potential. Soft Touch co-director Sally Norman said: “The project is aimed at young people and helping them to progress and broaden their horizons. We’re going to be working in partnership with all sorts organisations, such as schools and youth clubs, and also going out with our studio van to engage with people on the streets. Many other projects and organisations across the country have received grants of up to £10,000. In the city, grants have gone to Aqoon Schools Home Support Services, Crystal Clear Creators Crystal Radio, GNG Football Club, Goldhill Adventure Playground, The Gujarat Hindu Association, Leicester Philharmonia Orchestra and the Redeemed Christian Church of God. Elsewhere in the country, cash will go to Townlands Primary School in Earl Shilton, Highgate Community Primary School in Sileby, Wilbarston School Parents’ Association, Ridgeway Primary Academy in Market Harborough and the HIES The Enterprise Education Project, among others. Find the original article by Tom Mack, in the Wednesday, 17 August 2016 Leicester Mercury. The charity, Soft Touch, will host a 1980’s themed interactive exhibition throughout the month of November to mark its 30th birthday, following a VIP launch on Wednesday 2nd November sponsored by Newby Castleman. Established in 1986, Soft Touch uses arts, media and music activities to inspire and engage disadvantaged young people and help them to develop creative, social and employability skills. The VIP launch will include a private view of the exhibition and local dignitaries and business leaders will be in attendance. Newby Castleman is also celebrating a significant birthday this year as it enters its 65th year. Stephen Castleman, Partner at Newby Castleman, said: “Our 65th birthday is a fantastic opportunity for us to step back and take stock of everything we have achieved and the wide range of great companies we have and we still work with. The history and legacy of Newby Castleman speaks for itself. We have many clients that have been with us not just for years but for decades. Christine Wigmore, Business Development Director at Soft Touch, said: “We are delighted with the continued support from Newby Castleman, which will contribute greatly to the success of this anniversary event. This year is a very exciting time for us. The exhibition is going to be a fantastic opportunity not only to celebrate our 30th birthday but to showcase the work of the young people we strive to help and we simply could not do it without the support of local businesses such as Newby Castleman. Newby Castleman is one of the UK’s leading independent accountancy practices offering a range of specialist financial services, business and tax advice for individuals and businesses. Its head office can be found on Regent Road, Leicester and a branch office is located in Forest Road, Loughborough. The exhibition, called ‘Inside, Outside’, features the result of an eighteen-month arts workshop programme, led by award-winning Leicester charity Soft Touch Arts in collaboration with Leicestershire Partnership NHS Trust (LPT) which provides healthcare services at the prison. 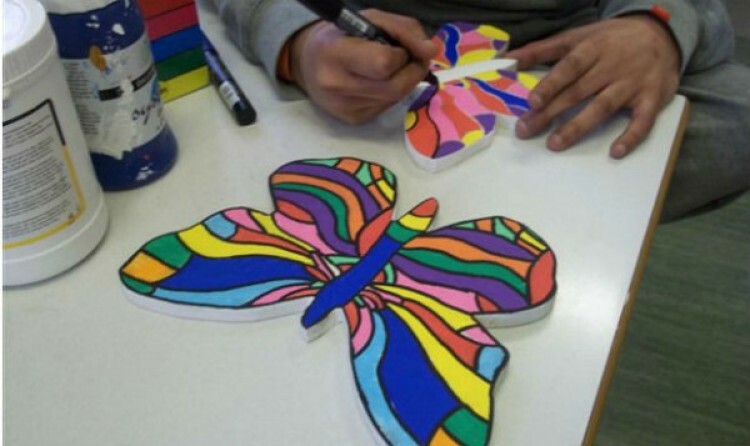 Weekly arts workshops, to improve the wellbeing of prisoners, particularly those with mental ill health and alcohol and substance misuse issues, were held. This gave an opportunity for them to attend the project to develop their creative skills and express themselves through their artwork. The project was supported by the Big Lottery Fund, Blaby District Council and the Charity of Carlton Hayes. The Inside Outside exhibition has been sponsored by 36 Crime and was opened by Mr William Harbage QC at a special private view on 7th July. More than 80 of the prison’s 400 18-21 year-old prisoners took part in the workshops which ran in two phases, with artwork from phase one now featured on the walls of the visitor centre at Glen Parva, and the phase two artwork included in the current exhibition. The sessions in prison were run by Soft Touch arts workers Kieran Walsh and Lewis Buttery. Following the success of the Glen Parva project, LPT, Soft Touch Arts and Leicester Prison have been awarded a £3,000 grant to work on a collaborative project called Healthier Choices. Inside Outside is on display at 50 New Walk, Leicester LE1 6TF from 11am-5pm Tuesday – Saturday until 28 July 2016. We’re pleased to announce that funding has been secured to launch a new project to support some of Leicester and Leicestershire’s most at risk young people. The project, called the Youth Employability Support (YES) project, will aim to transform the futures of 400 young people between the ages of 15 and 24 who are currently the furthest from being able to move into employment. It will focus on young people who face extra barriers to work, such as mental or physical health difficulties, homelessness, disabilities or being a carer, but it will also be open to any young person in Leicester or Leicestershire who is not in employment, education or training. This project has been developed over a period of more than a year alongside eight partners and the young people we’ll be supporting. This means that the project will be able to deliver innovative, person-centred solutions based on what young people really need. Unlike traditional services, the YES Project will deliver a bespoke journey for young people. YES Project staff will reach out to young people, assess their needs and then work with the young person to develop a support package that works for them. Support on offer will include one to one mentoring, work places, creative short courses, team building and more. These services will be delivered by the YES Project’s eight delivery partners: The Prince’s Trust, Seed Creativity, Soft Touch Arts, Twenty Twenty, Leicestershire Cares, Bangladesh Youth and Cultural Shomiti, The Bridge and Warwickshire College. The project has received up to £1.9m of funding from the Big Lottery Fund and the European Social Fund as part of the 2014-2020 European Structural and Investment Funds Growth Programme in England. The Department for Work and Pensions is the Managing Authority for the England European Social Fund programme. ts, media and music activities as tools to engage with and change the lives of disadvantaged young people in the area. The charity was established in 1986 and since then have helped and encouraged young people build confidence, find new hobbies and put them back on the right track. Working alongside local MPs, police, fire service, schools and local authorities, their work tackles local and national problems such as gang culture, anti-social behaviour and unhealthy lifestyles through the use of creative arts. With the weather thankfully holding out for the event the charity raised an impressive amount of money and gained good exposure. Emily Johnston from Soft Touch Arts said: “Evolve IT consultants hosted a fundraising BBQ outside their office, with all funds coming to Soft Touch. “The event saw other businesses from the business park attend to find out more about them, Soft Touch set up a stall with lots of materials and merchandise so that people could take things away to remember us, or pass them on. “Everything Branded donated us fantastic branded balloons, pens and wristbands, so we were able to give away branded merchandise. These were amazing, because the balloons really lightened up our stall, and wristbands are always a hit. 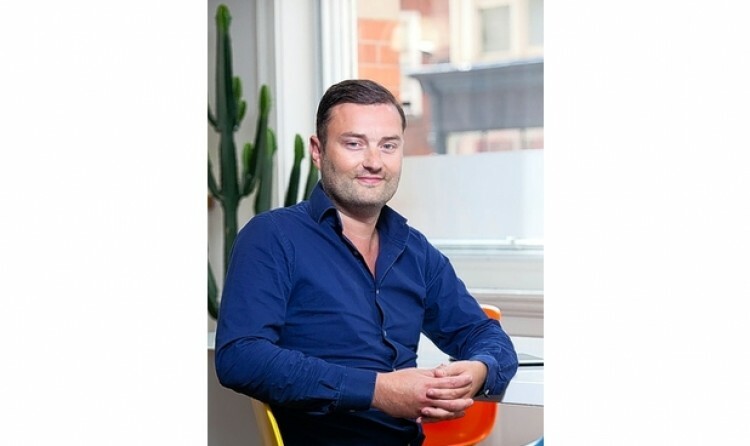 Paul Rowlett, Director of EverythingBranded.co.uk said: “We are always pleased to support charities such as Soft Touch, especially as they do such great work in our local area. “We are a company which has grown in Leicester and so we are always pleased when we can help charities which do work in the area we operate. The RICS Awards for the region were held on April 21 and among the winners was Soft Touch Arts in Leicester. The charity received the Community Benefit Award for its new £1.1 million centre in New Walk, which is a former car garage that has been transformed to help and inspire disadvantaged young people through the use of arts, music and media. Soft Touch was launched 30 years ago by a group of unemployed arts workers and helps young people who are disadvantaged for various reason, including youngsters in care, refugees and those with mental health problems. Director Christina Wigmore said: “We moved into the new building in June last year and it’s got music studios, art studios and kitchens where we teach cooking and catering skills. “Before we were based in a terraced house in Clarendon Park and mainly did outreach work. 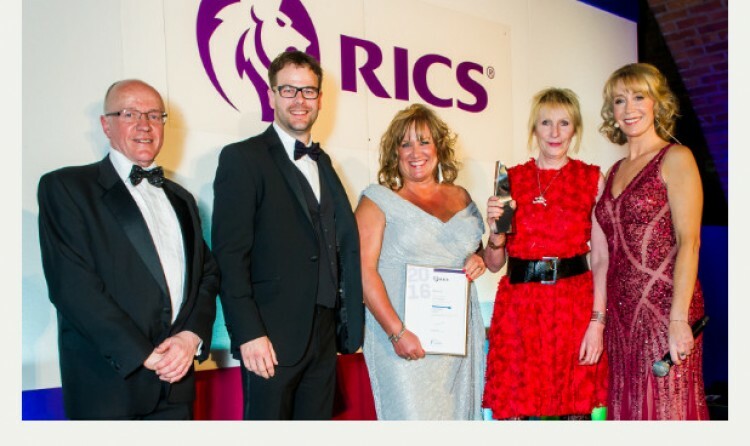 “Having the centre allows us to run a bigger range of activities, as well as fundraising events..
Robert Woolston, director of the architects, rg+p, added: “We are absolutely thrilled with the RICS win. The other city winner at the awards was Leicester Food Park, located near to Humberstone Heights Golf Club, which picked up the commercial award. Soft Touch Arts, based in Leicester, took advantage of a kind donation from one of Overbury’s major projects in the city to support its Re-Fab project, which uses arts to give disadvantaged young people aged between 14 and 25 opportunities to develop creative, life and employability skills. The Re-Fab project is funded by the RBS Skills & Opportunities Fund. Overbury is currently carrying out the £4.2m refurbishment of 40,000 sq ft of office space, located at 20-40 New Walk on behalf of Leicester City Council. The site is a stone’s throw from Soft Touch Art’s home at 50 New Walk. Christina Wigmore, director of Soft Touch Arts, explained: “When we saw the work going on next door, our arts project leader, Kieran Walsh, asked the Overbury team if they had any materials we might be able to re purpose for the Re-Fab project. They were very obliging and provided us with wood and metal that we were able to put to very good use. A special lunchtime event on May 19th will see the group showcase their work to business representatives who are invited to advise how the items can be marketed and sold. Overbury’s work on the 20-40 New Walk building is expected to be completed in June 2016, with IBM expected to move in shortly after. Soft Touch Arts, based in New Walk, Leicester, has been given the money from Star Trust. Star Trust is run by local business owners and entrepreneurs and supports good causes across the East Midlands. 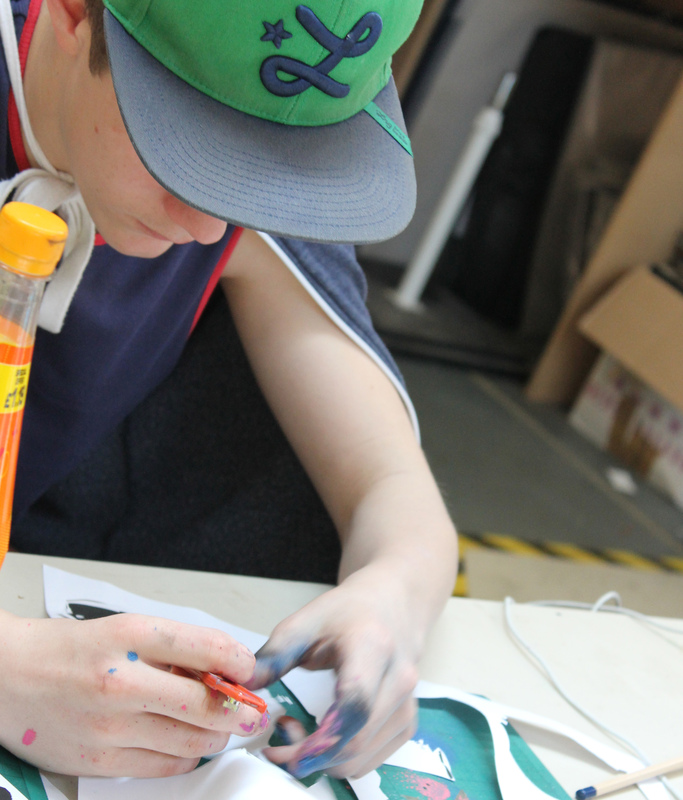 Soft Touch Arts uses art, media and music to support vulnerable young people. The donation will enable it to expand its Start referral programme, which develops the social skills, confidence and creativity of children and young adults with behavioural, physical and mental health difficulties. Star Trust committee member Gemma Orton said: “Soft Touch does incredible work with some of Leicester’s most disadvantaged young people and it’s an honour to be able to make this donation that will allow the Start referral programme to reach so many more children and young adults across the county. “Star Trust is committed to supporting small charities who can struggle to raise the funds they so badly need, and we are proud to be able to help these very worthy causes carry out the vital work they deliver in our communities. Vince Attwood, director at Soft Touch, said grants like this, formerly available from the local authority, were now difficult to come by. An exhibition at Sort Touch Arts showcases the work by young people from the Start referral programme. It is open this week and next week Tuesday to Saturday, from midday until 5pm. Soft Touch Arts welcomed Prince Edward and a host of VIP guests including Lady Gretton, the Lord Lieutenant of Leicestershire, and Gordon Arthur, the High Sheriff of Leicestershire, as they unveiled the city’s first youth arts and heritage centre at 50 New Walk. The organisation, which proides innovative creative art, media and music projects to help build skills and opportunities for vulnerable young people, has relocated from Clarendon Park following a major refurbishment that will enhance and improve its services to local young people. The Earl viewed the new kitchen, where Phil Sharpe, chef patron of The White Peacock, and three young volunteers prepared lunch for the Earl and 100 guests, before he participated in a creative music session with more Soft Touch youngsters. The event was topped off by performances from a drama group and beat poet before Prince Edward unveiled the commemorative plaque for the building. “The event today surpassed our expectations – it was a privilege to welcome HRH Earl of Wessex and our other guests to our newly completed building, and for our young volunteers to be recognised for their hard work. It has taken three years to bring this project to fruition, so we are all excited to be entering a new chapter in the story of Soft Touch Arts. The new larger premises will allow Soft Touch Arts to expand its creative projects, which include art and crafts, music, fashion, cooking, film, photography and the performing arts. The new facilities include a healthy eating kitchen, a multi-sensory workshop, a large performance, exhibition and event space, a craft and textile room, music rehearsal and recording studios, digital production suites, a stencil art studio and a sculpture garden as well as improved disabled access. The launch is being followed by an evening event at 5.30pm attended by Laura Dyer, Executive Director, Arts Council England, The City Mayor, Sir Peter Soulsby, and members of the local business community, as well as the young people that use the charity’s services. The centre’s refurbishment has been overseen by Smallman and Sons Builders and rg+p Architects who began work on the project in September 2014. 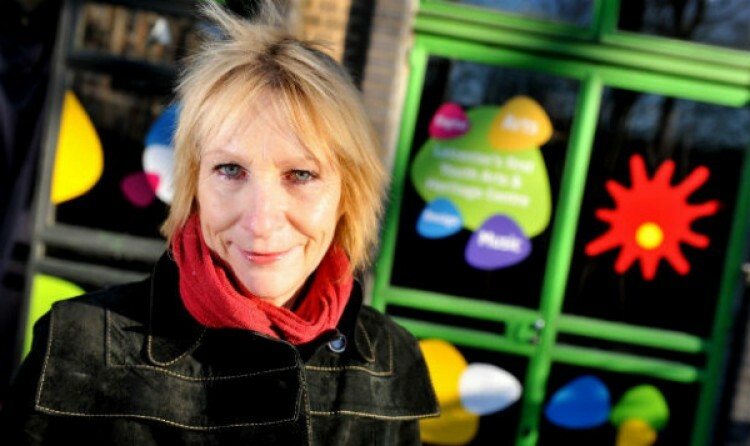 Christina Wigmore is the Business Development Director at Soft Touch Arts, a youth arts charity based in Leicester, which has recently opened Leicester’s first Youth Arts and Heritage centre on New Walk. Here, Christina gives an insight into a typical day at Soft Touch Arts. Christina comments: “My role is largely focussed on developing partnerships and making new projects and initiatives happen. Our biggest ever project, completed recently, is the move to our centre on New Walk, which was officially opened by HRH the Earl of Wessex. A huge amount of planning and organisation went into the event and to getting the building ready on time! “My working day normally starts around 7am, as I check my emails when I first get up, before arriving at work around 9am. The first job of the day is a phone call with a potential funder for a new business mentoring project we are looking to launch, which would provide our young people with access to advice and support to help them develop enterprise and business skills. This is followed by one of our quarterly business panel meetings. We have a group of 22 individuals from local businesses who kindly give up their time to advise us on current challenges and new initiatives we want to introduce, including finance and fundraising ideas. Our move will allow us to be more sustainable through renting out spaces for meetings, networking events and workshops.With public sector and grant funding shrinking, we need to be less reliant on this type of funding in the future, so coming up with new business ideas to make the charity more sustainable in the long-term is another key element of my role. “In the evening it’s off to a networking event, which I do at least once a week. It’s a great way to meet new people and raise awareness of Soft Touch Arts as it’s vital for us to make new connections and gain support from the local business community. We’re also looking for sponsors for our Brick in the Wall campaign, which is raising money to finish refurbishing and equipping our new premises, so launching and running fundraising campaigns is another important aspect of my role. The Leicestershire Partnership NHS Trust, which provides mental and community health services, Glen Parva and Leicester charity Soft Touch Arts have joined forces to launch an innovative year-long programme of creative arts workshops. The £10,000 project is supported by the Big Lottery Fund, charitable donations and contributions from the Leicestershire Partnership Trust and Glen Parva. A total of 40 workshops have been organised for offenders, particularly those diagnosed with a mental health issue combined with alcohol and substance misuse, to help improve their wellbeing and to brighten up their surroundings. So far, about 80 young men have taken part in workshops which will run until October. Kieran Walsh, from Soft Touch Arts, said: “We are working with young offenders to create artwork that will be displayed on the wall of the visitors’ centre which is a very large area with bare walls. “There are no fixed ideas about what the work should look like but we have all agreed it should have positive themes and that everyone in each group will have input into the final design. “The offenders came up with the idea of producing life-sized silhouettes of themselves, which they decorate with images and phrases that tie in with the theme. Natasha Garraway-Charles, Leicestershire Partnership Trust’s head of health care at Glen Parva, said the project offers a chance for participants to improve mental health, self-esteem and sense of achievement. A launch event on completion of the project is planned for World Mental Health Day in October. The work will also feature in Leicestershire Partnership Trust’s and Bright Sparks’ annual open art exhibition at Leicester’s West End Gallery from Tuesday, September 29 to Thursday, October 8. He first arrived at West Gate School, in Glenfield Road, in Leicester shortly after 10.30am. He unveiled a plaque to mark the official opening of the special school after its £9.3m refurbishment. The school has been upgraded as part of Leicester City Council’s Building Schools for the Future (BSF) programme. He then visited Soft Touch Arts in New Walk, Leicester, and finished the day at Loughborough College Arts Academy. At West Gate School, Prince Edward saw its new facilities including a sensory warm water swimming pool and soft play room. Acting head teacher Virginia Ursell said: “We had quite an amazing morning to be honest. “I think the children were very excited about it. We have been doing quite a bit of preparation work about who was coming and talking about the new building. “It is the cherry on the top of the cake to have him come. He is such a knowledgeable man. 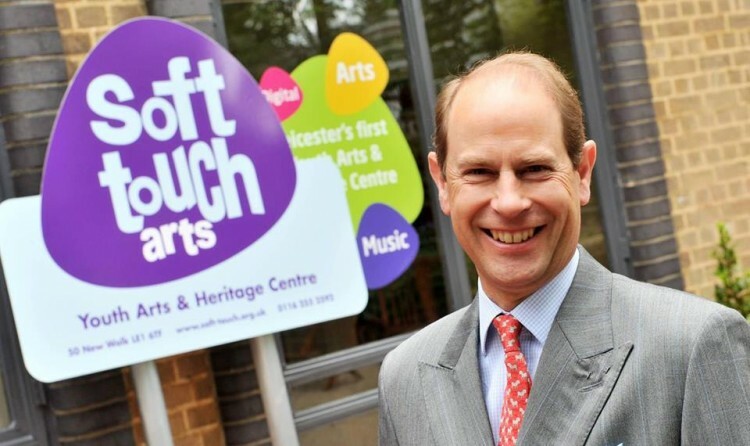 Prince Edward then visited Soft Touch Arts, in New Walk, Leicester to officially open its new £1.1 million premises. Business and strategic director of Soft Touch Arts, Christina Wigmore, said he was given a tour of the centre visiting many of the new facilities including a healthy eating kitchen, multi-sensory equipment, an exhibition space, a craft and textile room, music rehearsal and recording studios. She said: “It all went to plan. He was so interesting and down to earth. He wanted to ask the young people about their experiences. He was very personable, open and friendly. She added: That was the best thing about it, that the young people got to meet the prince. “It was a lovely atmosphere. All the guests really enjoyed it. We are all buzzing. 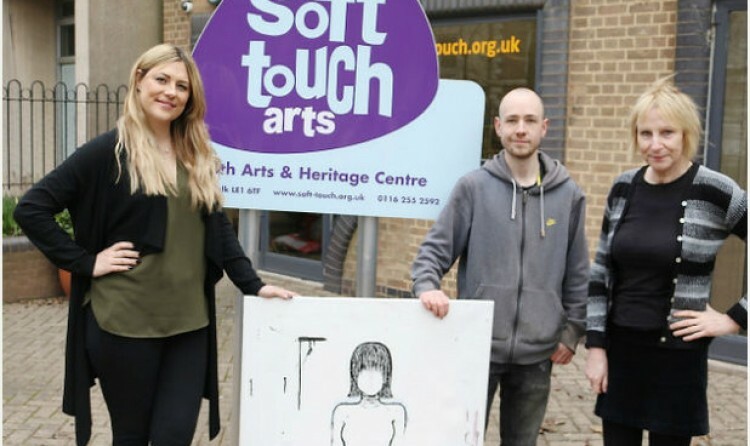 Soft Touch Arts, which provides creative art, media and music projects to help build skills and opportunities for vulnerable young people, has moved from its premises in Clarendon Park following a major refurbishment to improve its services to local young people. Prince Edward then travelled to Loughborough to mark the official opening of the new Loughborough College Arts Academy where he also unveiled a commemorative piece of work. He was joined by the Lord-Lieutenant of Leicestershire Jennifer, Lady Gretton for his tour, which was led by Loughborough College Principal and chief executive Esme Winch. Ms Winch said: “We have been honoured to welcome The Earl of Wessex to formally open our Loughborough College Arts Academy. “We wanted to commemorate this very special visit by His Royal Highness with something more than a conventional plaque. See the original article on the Leicester Mercury website. Companies are being asked to donate £200 in return for a brick at the New Walk centre, designed by young people using the charity which will incorporate their company logo and be displayed on a wall in the entrance lobby. City building contractor Smallman and Son was the first firm to sign up after overseeing the refurbishment. We then meet with charity Soft Touch Arts, we first met them at the business awards and felt able to help out with design and marketing services. The charity uses arts, media and music activities to engage and inspire young people to help develop their social and employability skills. As creative organisations, both Arch and Soft Touch agreed we could form a great partnership. We’re thrilled to work with them on their mentoring and marketing needs as they push fundraising requirements to enable them to move into their new premises on New Walk. Soft Touch aims to turn a derelict building on New Walk into a “buzzing new arts and heritage centre for young people” over the course of the next year. It will take a massive fund raising effort but the seeds have already been sown and business and strategic director Christina Wigmore is hoping local firms will add their support. Soft Touch has been based in Clarendon Park since 1995. The participatory arts charity helps more than 1,000 young people a year via innovative creative projects that give them a new focus; getting them involved in things such as performance, music, film and literature. The main age group is 13 to 19 and Soft Touch’s projects engage young people and help them to tackle issues that affect them and their communities. But the organisation has long felt that a base in the city centre would enable it to reach more youngsters as well as expand on the activities it can offer. Eventually, a move to what was the Val Jones Centre – the city council’s old workplace nursery on New Walk – seemed the best bet. 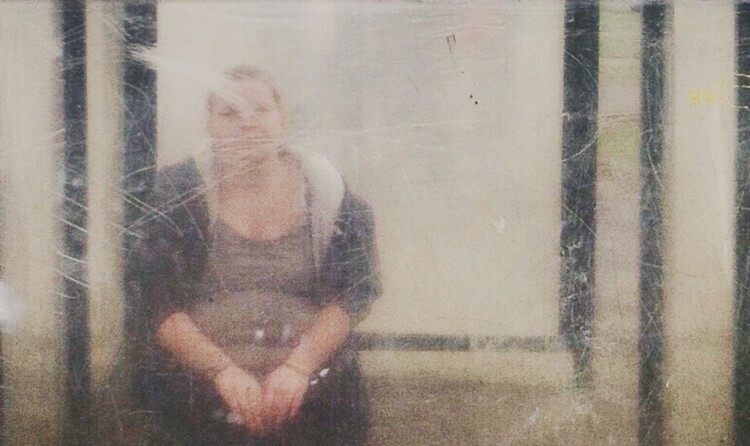 Christina says: “In 2011 we went to visit 50 New Walk which had been empty for five or so years. “We knew immediately it was the place to realise our vision of creating an amazing, buzzing new arts and heritage centre for young people – a place where young people who lack opportunities to participate in arts, culture and heritage can develop their creative potential, broaden their horizons and be part of the cultural life of the city. “Clarendon Park has never been ideal as it is outside the centre and difficult for young people from different parts of the city to reach.We call it the Tardis and we certainly get good use out of it but it sits on a terraced street and the range of activities and numbers of young people we can work with is very limited, even though the demand is high. Christina admits that there’s still plenty of work to be done to turn the dream into a reality and a lot more cash to find. But Soft Touch has got off to a great start. She says: “It’s a very ambitious project for a small charity but we are confident we’re going to make it a great success. “We’ve recently had some great news in getting through the first round of the Arts Council Capital Scheme. The building has massive potential for Soft Touch. There’s room for an exhibition hall, for studios and offices and space to create music and art. The location will put Soft Touch close to the heart of cultural life in the city. But Christina admits that the building is “currently in very poor condition”. “We have a big 12-month fundraising campaign ahead to refurbish and turn it into the place we and the young people we work with would like,” she says. “The location brings all kinds of opportunities for public and business engagement and support. “We have exciting plans for outdoor art and performances on New Walk, working with the museum, inter-generational heritage activities and using the building for pop-up exhibitions, a healthy eating café, performances, art auctions and craft sales and digital projection artwork using the forecourt. In order to win the support of the business community, Soft Touch organised a special business reception last month to introduce themselves to potential backers. The work on bringing the building back to life has already begun. Christina adds: “We had 33 volunteers from New Parks helping us get the building ready for the business event. Read the original article on the Leicester Mercury website. Young people from the Soft Touch Arts charity joined architects rg+p to design a new arts and heritage centre in New Walk. Architects and designers from rg+p organised two design sessions for the young ambassadors aged 15 to 18. Included were a tour of the firm’s New Walk office, and an insight into how buildings are designed. Soft Touch Arts use arts, media and music activities to engage young people and help develop social and employability skills. Their work tackles problems such as gang culture, anti-social behaviour and unhealthy lifestyles, using creativity to give young people more positive choices in their lives. Christina Wigmore, the charity’s business and strategic director, said: “This is a very exciting time for the charity as we open the centre and launch some additional programmes supporting young people who lack opportunities or have challenges in their lives. “The centre will include music technology studios, a live rehearsal and recording area, an arts and crafts area and creative project space. “Ensuring the building is attractive to young people by involving young people in the design is very important. Rob Woolston, director at rg+p, said the sessions covered a wide range of design concepts. He said: “We’ve given an insight into building design and encouraged the team to consider how colour, texture, materials and lighting can be used in different ways within the centre and its space. Leicester-based Soft Touch Arts offers a range of outreach projects for people of all ages. Using arts and crafts, mobile street sessions, health awareness campaigns and mentoring, their aim is to bring the community closer together. The charity extended its work on Leicester’s New Parks Estate after receiving funding from BIG in 2011. From young to old, there’s something for everybody. On Wednesdays the sound of laughter can be heard from the Sharmon Crescent Tenants and Residents Association. Here a group of mums take part in weekly ‘On the Make’ sessions which teach women to create craft items from recycled materials, learn new skills and establish stronger friendships. At New College, a group of children also gather weekly to tackle issues of bullying. Using design, computer skills and most importantly teamwork, the group’s goal is to develop an anti-bullying programme from their own perspective. Healthy eating and lifestyle is the focus at the Parks Primary School’s ‘Well Cool’ group. Children and parents are invited to attend together, to talk about the importance of a well-balanced diet, and learn to cook healthy, nutritious meals. Back at Soft Touch Arts’ main base, creative mentoring sessions are offered for young people not in employment, education or training. Berwick is 17 and his passion is music. Working with his mentor to create his own track has boosted his confidence. “I like it here and the staff are nice,” he says. To him, it’s a place to make friends. Dwain is only 14, and fell out of the education system two years ago. Soft Touch provides him with a place to go and express his creative talents, of which there are many. He now attends arts sessions three times a week and his mentors have seen a real change in his behaviour. For both Berwick and Dwain, the Creative Mentoring sessions have allowed them to take pride in their work and build for the future. To the same degree, the staff and volunteers at Soft Touch have equal reason to be proud of what they’ve achieved. The vacant property, which had been earmarked in 2009 to become the new council-run art gallery is set to be sold to a community arts group. The building is owned by Leicester City Council, and was previously home to the council’s nursery before it closed in 2006. City mayor Peter Soulsby has agreed to sell the building to Leicester organisation Soft Touch Arts Ltd, which works to get young people involved in a range of arts and community development schemes. The organisation, which is based in Clarendon Park, wants to buy the building and convert it into an arts and heritage centre for young people. Sir Peter said: “This is a great way to bring a vacant building in a prime location back into use. Last week, I went to the launch of Big Up New Parks, a youth and community service, run by Soft Touch Arts, which does things in a totally different way. Soft Touch is a voluntary organisation that works with young people to develop their activities, so what they offer is what young people actually want to do. They take their services to where young people are, rather than expecting young people to come to them. Big Up New Parks is funded by the Big Lottery Reaching Communities Programme. It offers creative activities in New Parks that are accessible, fun and relevant, and which aim to engage young people, their families and the wider community. The project launch was brilliant. They had the Soft Touch Beatsmobil, where young people can learn to rap and create their own music tracks. I had some delicious veggie curry and tuna pasta – healthy meals created and cooked by young people themselves. There were lots of other things going on, including kids face painting and spray painting. When I chatted to the young people who had made the food and performed their own music, I saw how much they enjoyed getting involved. And I saw how preparing and serving a meal, or performing a rap they had written in front of family and friends, was a real boost to their self-confidence and sense of self-esteem. Once young people and their families are on board and involved, Soft Touch Arts can offer other types of help and support, such as Positive Vibes, a programme which helps promote friendships and tackle bullying at school and in the community. 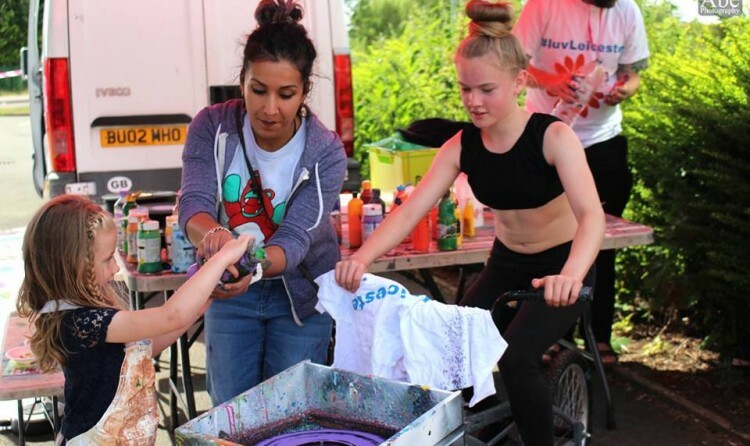 I think Leicester has some great youth services: not only Soft Touch Arts but charities such as Street Vibe, which has mobile dance pods they take out into the community so young people can do street dancing. There are two key lessons to draw from the work these fantastic organisations do. First, youth services have to reach out to young people, not the other way round. Politicians often talk about groups of young people who are hard to reach, but Soft Touch and Street Vibe show, if youth services work in a different way, this doesn’t have to be the case. Second, services which start by engaging young people but then work with the whole community to get families actively involved, can make an even bigger difference to local residents. Good quality youth services can help unleash young people’s skills and talents, keep them off the streets, and reduce crime and anti-social behaviour, too. In the long run, this benefits us all, including saving taxpayers’ money. I am a huge supporter of Leicester’s youth services and will continue to do all I can to champion them, both locally and in Westminster. An ex-teenage offender who won a community award after turning his life around has helped to launch this year’s search for young achievers. Ben Clarke received the Lord Lieutenant’s Young Person of the Year 2010 title in March, after being chosen out of 60. Since winning, the 19-year-old has spoken to other young offenders about his achievements over the past few years. A few years ago, Ben spent several months in a young offenders’ institution for violent attacks. But, after being recommended for a community arts programme, he now creates music and art and mentors others. He was joined by the Lord Lieutenant of Leicestershire, Jennifer, Lady Gretton, at Soft Touch Arts, the Clarendon Park, Leicester, centre he credits for helping him leave his past behind, to launch the Young Person of the Year 2011 award yesterday. He said: “The award has given me more confidence and belief in myself. I think it’s helped gain trust from people, because a lot of people lost trust in me because of the things I’d done. “When I came out, I decided I wanted more. I want a house, kids and a Ferrari one day. “I want to stick with my music and get a job as well and then maybe I can save up and get my own studio. “I’ve talked to other kids. Some won’t listen but there are those that will and say ‘I don’t want to end up there’ (prison). The Lord Lieutenant’s Award, now in its fifth year, is open to teenagers living in Leicestershire. There are five categories – bravery, kindness in helping others, improving the community, a voice for young people and creativity and innovation. Ben picked up the creativity and innovation prize, in March, and then chosen as overall winner by Lady Gretton. She said: “I thought Ben had done some amazing things. “He’d obviously had problems in his life but he wanted to change and that’s wonderful. Ben’s mum Jean, who also attended the launch yesterday, said her son was now a different person. Kieran Walsh, a youth worker for Soft Touch who was previously Ben’s youth offending worker, nominated him for the award.